Wesleyan University Press, 9780819574305, 223pp. 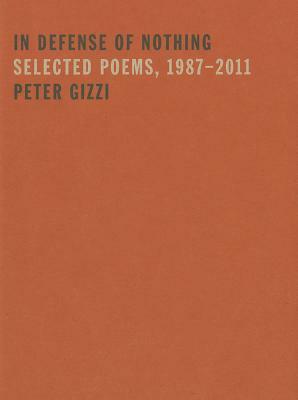 Since his celebrated first book of poetry, Peter Gizzi has been hailed as one of the most significant and distinctive voices writing today. Gathered from over five collections, and representing close to twenty-five years of work, the poems in this generous selection strike a dynamic balance of honesty, emotion, intellectual depth and otherworldly resonance--in Gizzi's work, poetry itself becomes a primary ground of human experience. Haunted, vibrant, and saturated with luminous detail, Gizzi's poetry enlists the American vernacular in a magical and complex music. In Defense of Nothing is an immensely valuable introduction to the work of this extraordinary and singular poet. Check for the online reader's companion at http: //petergizzi.site.weleyan.edu. PETER GIZZI is the author of Threshold Songs, The Outernationale, Some Values of Landscape and Weather, Artificial Heart, and Periplum. He teaches at the University of Massachusetts, Amherst.